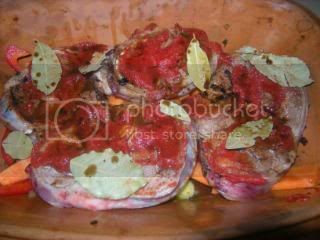 Osso Bucco is an Italian dish that is currently quite popular, although the modern versions vary quite a bit from the traditional. Even within the current vogue, though, there is a huge amount of variation from recipe to recipe. I rarely make it the same way twice. This is probably as close to a ‘traditional’ version as I get though. 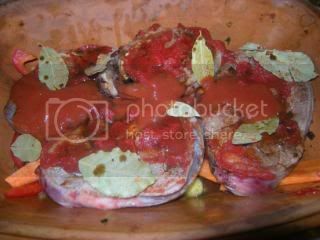 The term Osso Bucco can be literally translated from the Italian to mean (I am told, and I’m happy to be corrected by any Italian speakers out there!) ‘hole bone’. 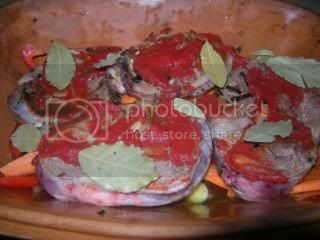 It is either veal or beef, and it is cut from the leg, which leaves a single large bone in the centre of the cut, filled with marrow. 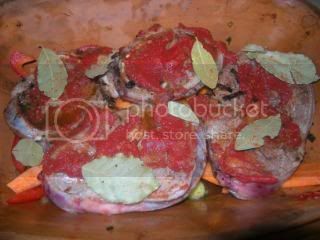 Veal osso bucco can be hard to find, although some butchers will stock it on request. I have – just once – been lucky enough to find it on the shelf in Coles, which surprised me enormously, and of course I snapped it up. This time, I got some yearling, so it’s a little more tender than the beef ones you buy normally, but without the delicate flavour you get from veal. Accordingly, I cooked it with beef stock, and went heavy-handed on the chilli and other flavours. A veal cut would require quite a lot more of a light touch! In terms of variations, you can literally do just about anything. 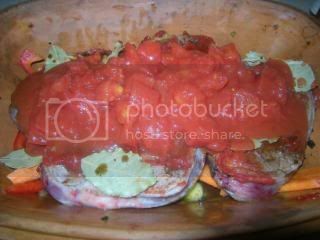 I’ve done versions with bacon, pancetta, a thick beefy gravy without tomato, and with all sorts of variations in the vegetables. I haven’t specified vegetables in this recipe, just throw in whatever you have. Traditionally, it would be carrot and celery. 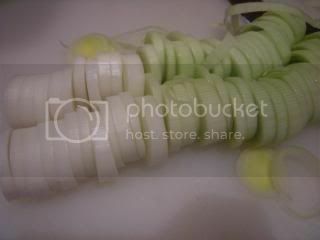 I’m not a fan of celery in this type of thing though, so I’ve left it out. 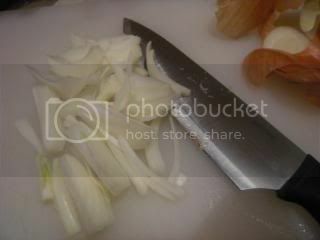 Leek and capsicum is always a lovely combination in this type of cooking, though, at least to my mind. Try it according to the recipe the first time if you’re unsure, and then just go nuts and throw in whatever you like the look of. Don’t forget to drop your comments in at the bottom of the post, either, and let me know how you go with it. What did you hate? What did you love? What did you change? What will you be trying again next weekend? OK, what do we have here? 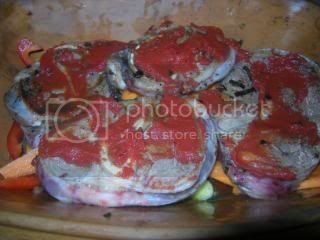 Some yearling osso bucco (of course! 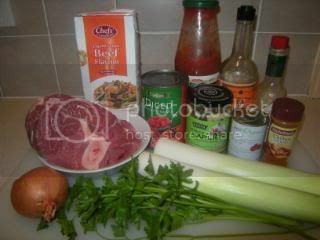 One per person); beef stock; a tin of diced tomatoes; some passata; minced garlic (one or two minced cloves would be just as good); worcesteshire sauce; tomato paste; tabasco sauce; ground chilli (or use a deseeded and finely sliced red banana chilli); I’ve also got a brown onion, some fresh continental or flat-leaf parsley, and a couple of leeks. Not pictured is the red capsicum and the carrot that I threw in. But we’ll get to those! I’ve cooked mine in the Römertopf, and if you are too, then you will need to put it on to soak now. It will work just as well in a ceramic baking dish covered with foil. If you’re going that way, turn your oven on to 180 degrees to pre-heat now. 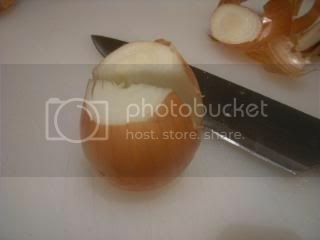 Lop the top and bottom off the onion, cut it in half, and remove the skin. Then cut it into wedges. 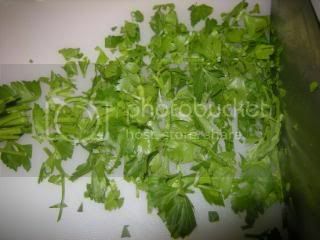 And here’s our parsley, all chopped up. Give it a couple of go-overs with your chef’s knife. Chunky is good, but make sure it’s not too chunky. 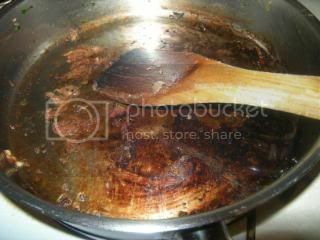 Put a saucepan over medium heat, and drop some oil in. 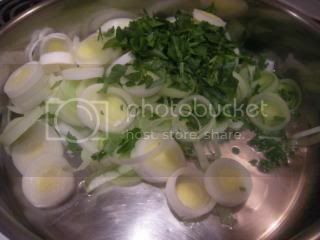 Throw in the onion, the leek, and the parsley, all together. 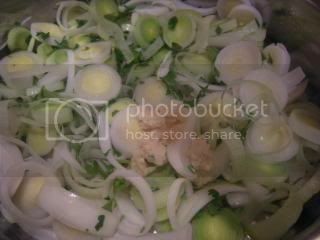 Stir it all together, and drop in the minced garlic. 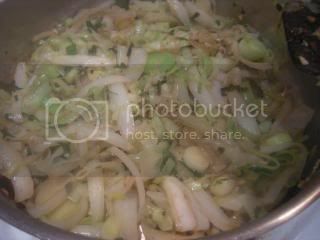 Keep stirring it for about 5-10 minutes, or until the onion and the leek have completely softened up. Throw into your damp Römertopf, or baking dish. Prepare and chop up whatever vegetables you’re going to be using. I’ve got a sliced red capsicum, and some carrot sticks here. And drop the osso bucco in. 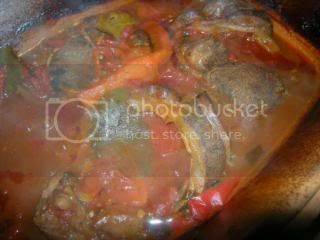 You might need to do it in batches, so that you don’t overcrowd the pan and stew the meat. You want to just give it a little colour before it goes into the oven. About a minute or two on each side. 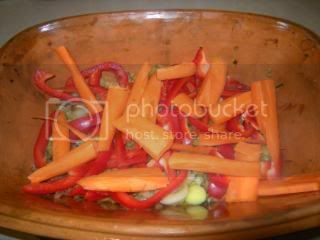 Once they’re browned, arrange them over the top of the vegetables. If you can avoid overlapping them, do. Otherwise, try and make it as even as you can. Here’s our lovely grotty pan, so let’s get deglazing. This time I’m using beef stock. Red wine would also work well. 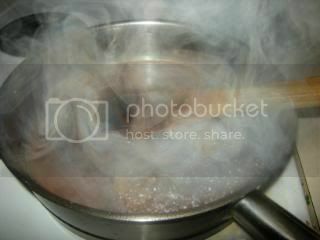 Throw in a good amount (and watch your fingers – I managed to catch mine in the steam this time and … owwww! It hurts!). 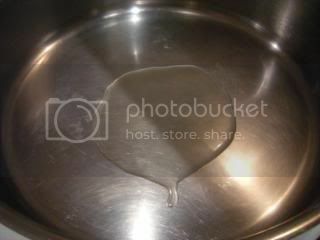 Don’t hesitate to use a lot, we need a fair bit of liquid in the baking dish. 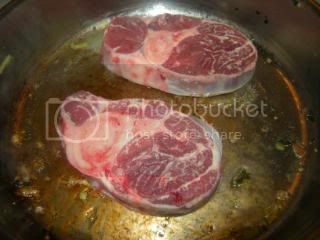 Scrape out the pan, and throw the lot in on top of the meat. Then throw a little more stock over it. You want to use a cup or two if you’re cooking in a Römertopf, half to a cup if you’re using a baking dish. 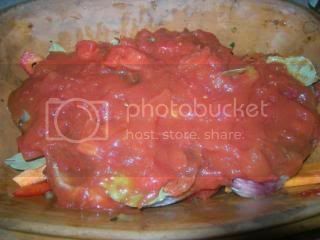 Dot some tomato paste over the meat. Use about half a small tin of paste. 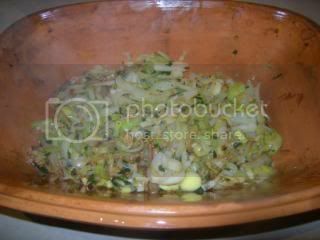 And here’s another ingredient I forgot to mention at the top – bay leaves! Be fairly generous, and scatter them around over the meat too. I was hoping you would be able to see it, but unfortunately you can’t really. Anyway, give it a healthy shake of chilli powder (or sprinkle your finely sliced red banana chilli over it). I also put in a few slurps of Tabasco here. Of course, you can just skip this step if you don’t like it hot, or use less. Dribble a bit of Worcestershire sauce over it, but don’t be too heavy-handed with it. Give it a bit of passata (it’s the brighter red stripe right up the middle). This is just to stretch the tin of tomatoes a little further. I probably could have just used two tins of diced tomatoes instead. 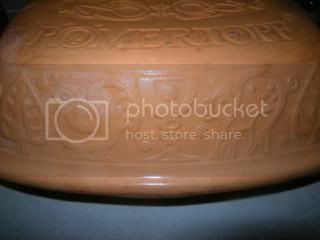 If you’re using a baking dish rather than a Römertopf, I’d leave the passata out. There’ll be quite enough juices without it. And use the back of a spoon to spread it out as evenly as you can. Put the lid on, or cover the lot with foil. If you’re using a Römertopf, put it into a cold oven, turn the heat on to about 150 degrees, and cook it for anywhere upwards of three to four hours. 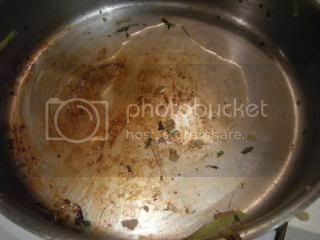 If you’re using a baking dish, put it into a warmed oven at 180 degrees, and cook it for an hour to two hours. 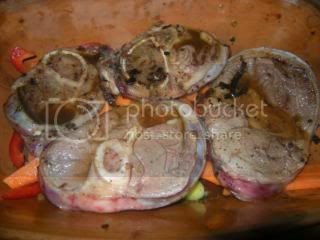 For both methods, give it a squiz every hour or so, and gently turn the osso bucco over each time, to immerse it back into the liquid. 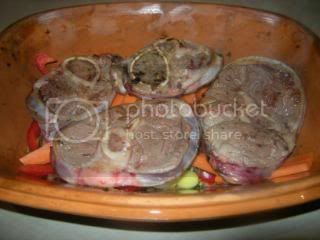 It’s cooked when the bones start to pop out of the osso bucco, and the meat is tender. Be gentle when you’re turn the meat over, or you’ll lose the marrow out of the bones. Here it is all completed. It is awesome served with a creamy polenta (I’ll get a recipe for that up here), but if that’s not your thing, plain creamy mashed potato works really well too. 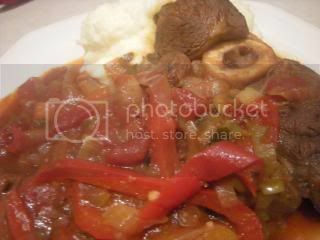 Mashed potato first, grab the osso bucco out with some tongs, and then spoon the sauce and vegetables over the top. Delicious! 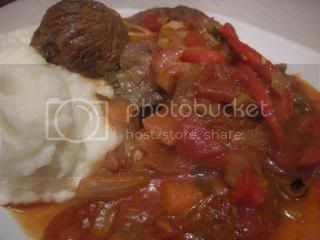 Photos are all up in the Osso Bucco Photobucket album. Oh, and did you notice the star ratings at the top of the post? Let me know what you like (and what you don’t!) so I can get more of the recipes you want up here.